Knobs vs. pulls. One of the first decisions to consider is whether to choose all knobs, all pulls, or a combination of both. When a combination is used, pulls are commonly used for drawers, while knobs are used for cabinet doors. Another popular option is to use cup pulls for drawers in combination with straight pulls or knobs for cabinet doors. Regardless of the combination used, knobs and pulls should coordinate in both finish and style. Comfort. Comfort should be the deciding factor when it comes to choosing between knobs and pulls, as well as style. Test how the different styles feel in your hand. Try to consider anything about the piece that might bother you down the road, such as a knob that has sharp square edges or a pull that seems too short or shallow for your fingers to fit comfortably beneath. You may want to consider having family members test the various options as well. Finish. While there are many types of finishes available, deciding on a color preference helps narrow the choices from the start. Most finishes essentially fall within one of these colors: gold (brass), silver (chrome or nickel), brown (bronze), or black. Once you choose a color preference, different finishes can really add character and depth to a room. Options within the silver color family include chrome, stainless steel, polished nickel, satin nickel, and antique silver. The most popular options within the gold color family include polished brass and antique brass. Options within the bronze family include antique bronze, oil-rubbed bronze, and Venetian bronze. Even black finishes come in a variety of tones and sheens. 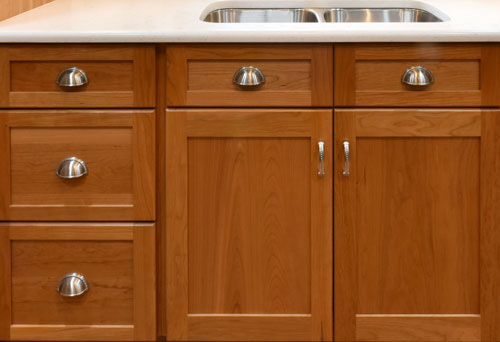 Though it doesn’t need to match exactly, the color you select for cabinet hardware should coordinate with the cabinet finish, as well as kitchen appliances, lighting fixtures, and plumbing fixtures. Size and position. Determining the best size and position for hardware can help ensure ease of use of your cabinets and drawers. Generally, pulls are used vertically on cabinet doors and horizontally on drawers, although a trend in modern designs is to place pulls horizontally on doors as well. When considering this look, you may want to try out a horizontally placed door handle to make sure you feel comfortable opening a door that way. Pulls or knobs that are placed too high on top cabinet doors may not be easy for everyone to reach. On drawers, pulls that are too narrow or too wide may look disproportionate. If you have different sizes and widths of drawers and are using pulls, it is best to choose a pull width that accommodates the varying sizes, or use two pulls on wide drawers (one on each side). Similarly, if knobs are used, installing knobs on each side of a wide drawer could make it easier to open. Styles. Cabinet and drawer hardware comes in a variety of styles to compliment any room, from minimalist and modern to ornate and traditional. When choosing a style, make sure it coordinates with the overall look of the room, and isn’t something too trendy that you may grow tired of a few years down the road. If you are considering a kitchen remodel, give us a call. We can help you decide which hardware options are best for your project!